It is with great sadness that South Carolina AHEC marks the passing of Sharm Steadman, PharmD, BCPS, PASHP, CDE, BC-ADM, who lost her battle with cancer in October. Dr. Steadman was a longtime partner of the South Carolina AHEC System as well as an exemplary teacher and role model. The South Carolina AHEC System has been proud to count her among its partners and educators. As such, the South Carolina AHEC has decided to name its award that recognizes excellence in education after Dr. Steadman. The Sharm Steadman Excellence in Family Medicine Education Award will be given to a non-physician member of the faculty of a South Carolina family medicine residency program who has distinguished him/herself as an outstanding teacher and role model. Dr. Steadman received this award herself in 2012 as she represented exactly what this award was created to recognize. Dr. Steadman was a professor with the USC Department of Family and Preventive Medicine, where she practiced for 25 years. She also served as the director of pharmacotherapeutic education for USC/Palmetto Health Richland Hospital Family Medicine Residency Program. She received her Bachelor’s of Science in Pharmacy from the University of North Carolina at Chapel Hill and her Doctor of Pharmacy degree from MUSC. Dr. Steadman’s focus was teaching and implementing quality improvement and patient-centered, team-based care strategies in primary care. She served as the chair of the Continuing Education Committee of South Carolina Pharmacy Association for four years and served as the president for the Fifth District Pharmacy Association since 2008. Dr. Steadman’s contribution to the field and to the education of her students are numerous and she has been recognized many times, including receiving the 2015 Bowl of Hygeia Award for outstanding community service from the American Pharmacists Association. The Bowl of Hygeia Award recognizes pharmacists who exhibit outstanding records of civic leadership in their communities and encourage pharmacists to take active roles in the communities in which they live. This award is considered one of pharmacy’s most prestigious awards. In addition, Dr. Steadman has also received the 2012 South Carolina AHEC Excellence in Family Medicine Education Award, 2012 Diabetes Champion of the Year with the South Carolina DHEC Diabetes Prevention and Control Division, 2009 Outstanding Faculty Award with the USC/Palmetto Health Richland Family Medicine Residency Program, and 2007 Pharmacist of the Year with the South Carolina Pharmacy Association. Dr. Steadman was an advocate for patient-centered care and an outstanding teacher. Her contributions to her field, the education of her students, and the healthcare of citizens across the state cannot be enumerated. She will be greatly missed. Lowcountry AHEC’s Health Careers Program (HCP) and Health Profession Student (HPS) Program are collaborating on the AHEC Pipeline Connects project for the third consecutive year. The project enables participating HPS students to practice working as an interprofessional team by teaching HCP and middle school students about healthcare professions. Lowcountry AHEC also hopes to increase interest and recruit middle school students into their HCP program and, ultimately, to increase the number of HCP students being accepted into health careers programs and becoming health professionals. In 2016, Lowcountry AHEC will begin Connecting the AHEC Pipeline, an activity that connects eighth grade students at Colleton County Middle School who are interested in health careers with the HCP students and HPS students. During the eighth grade students’ last class period, the HPS students will share information about their health career and discuss what students need to do to be accepted into a health profession program. Additionally, Lowcountry AHEC HPS coordinators and the health professions students will meet to discuss their respective disciplines. 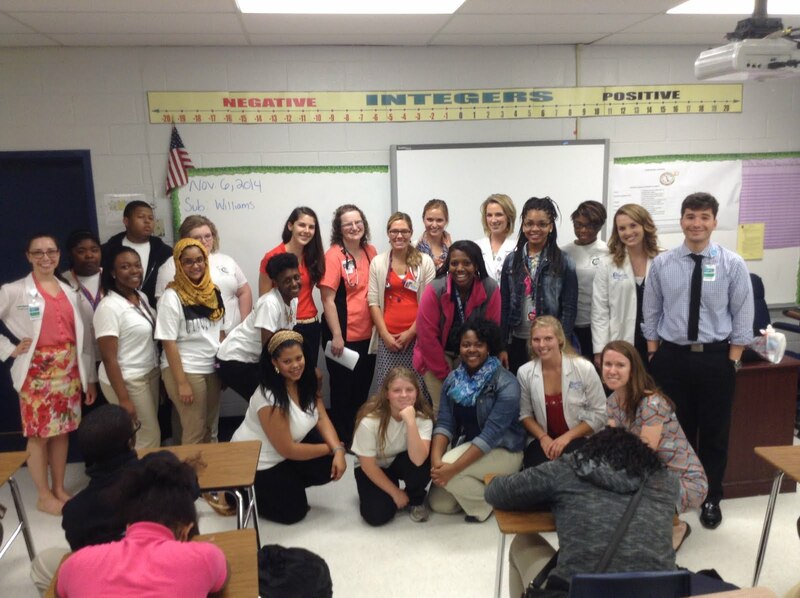 Health profession students will be recruited from colleges and universities from around the Lowcountry for participation. The Institute for Primary Care Education and Practice (IPC) wrapped up a successful fall semester in November, including the addition of a fourth cohort of IPC fellows. This year, the IPC welcomed 28 new student fellows, including its first cohort of students from the South Carolina College of Pharmacy at MUSC. To further students’ interest in primary care, the South Carolina AHEC in 2012 worked with leaders on the USC and MUSC academic campuses to establish the IPC. Initially funded for three years through The Duke Endowment, an IPC core team of faculty from the South Carolina AHEC and the universities identified medical, advanced practice nursing (APN), and physician assistant (PA) students early in their training who expressed interest in primary care careers. In 2015, the academic programs began funding for the IPC. With the addition of the pharmacy students, the IPC now consists of 100 student fellows from six colleges and two universities. 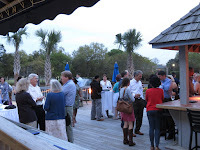 Fellows from across the state connect by video for monthly seminars, which are recorded and made available on the South Carolina AHEC website. 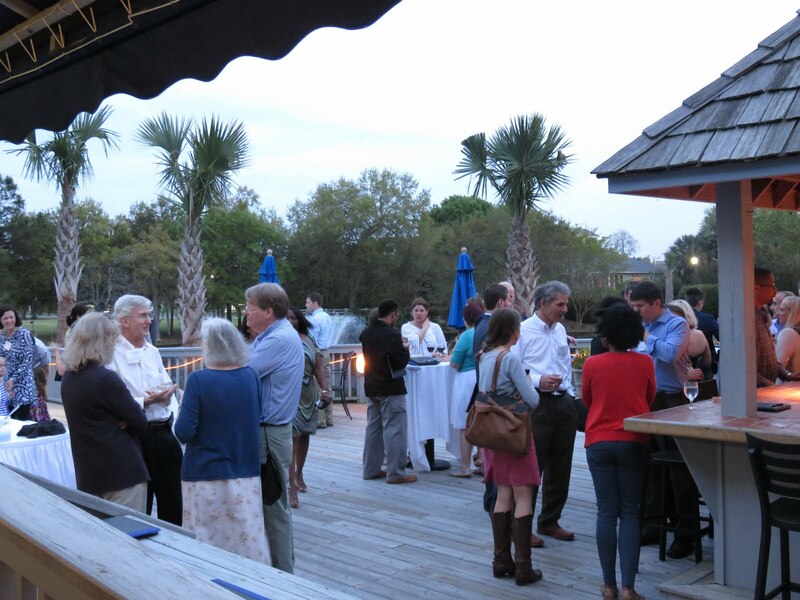 The IPC hosts an annual retreat with fellows, preceptors and faculty each spring featuring distinguished guest speakers and outstanding networking experiences for the fellows. Fellows from MUSC also can participate in two elective patient-centered courses that focus on the delivery of interprofessional primary care in a community setting. In 2015, an exit survey was sent to 27 graduating fellows to determine their level of involvement in IPC activities, the value of the IPC and the type of clinical practice they have entered upon graduation. One hundred percent of the responding graduating fellows (N=20) found the IPC to be of value and all plan to begin practice in primary care upon graduation. Fifty percent of the students indicated they intended to practice in family medicine, 20 percent in pediatrics, five percent in internal medicine and the remainder chose more than one of these primary care specialties. Identification and support of practices and preceptors incorporating core competencies of interprofessional collaborative practice are vital to providing outstanding clinical experiences, particularly in rural and underserved communities. Currently, there is an interprofessional group of 34 primary care preceptors from family medicine, pediatrics and internal medicine who have joined the IPC. Excellent ambulatory care pharmacy preceptors are currently being recruited. Want to become an IPC preceptor? Contact randals@musc.edu for more information. For more information on the Institute for Primary Care Education and Practice or to view any of the recorded seminars, visit scahec.net/primarycare. Stephanie Slayman joined the South Carolina AHEC Program Office on November 16 as a program assistant for the Office for Telehealth Education. Stephanie recently relocated to Charleston from the Greater Boston Area, where she was a staff assistant in the Department of Romance Languages at Harvard University. Stephanie has her Associate’s Degree in Business Administration and most recently worked at MUSC Health as a patient access representative in pediatric outpatient care. Stephanie’s knowledge and experience of education and healthcare will be an excellent addition to the AHEC team. Stephanie’s favorite pastimes include traveling and supporting her home sports teams (Go Patriots!). She looks forward to new opportunities in Charleston and a definitive lack of snow in the lowcountry. Welcome Stephanie! She can be reached at slayman@musc.edu and 843-792-6222. The South Carolina AHEC is pleased to announce that it is accepting applications for the South Carolina Rural Dentist Program. The South Carolina Rural Dentist Program was implemented in 2005 to assist dentists who serve in South Carolina’s Health Professional Shortage Areas (HPSAs) or serve as full-time faculty at the MUSC College of Dental Medicine in repaying educational loans. The expectation is that during their commitment period these dentists will establish viable community practices or academic careers at the College of Dental Medicine, become involved and remain in their respective communities after the funding period is over. Priority for this program is given to those demonstrating need and expressing intent to remain in an underserved area or in an area of critical need at the MUSC College of Dental Medicine. To date, 45 rural dentists and 14 faculty members at the MUSC College of Dental Medicine have been funded. For more information on the South Carolina Rural Dentist Program, please visit the South Carolina AHEC webpage. The deadline for applications for this funding cycle is February 15, 2016. Applications postmarked or received via email after this date will not be accepted. The South Carolina AHEC is pleased to announce that applications are being accepted from primary care physicians (family medicine, pediatrics, internal medicine and OB/GYN) and advanced practice professionals (nurse midwives, nurse practitioners and physician assistants) who contract for a period of four years to practice in rural or underserved areas of South Carolina. Awards for physicians will vary with the minimum award being $60,000 and the maximum award being $100,000 depending upon the type of practice setting and the population of the South Carolina county in which they will practice. Awards for advanced practice professionals will vary with the minimum award being $30,000 and the maximum award being $50,000 depending upon the type of practice setting and the population of the county in which they will practice. Provide $15,000 per year for up to four years for qualified physicians who work in rural areas of other counties (non-urbanized) as defined by the U.S. Census Bureau’s 2010 Census or who work in federally qualified health centers in urban areas. Provide $12,500 per year for up to four years to advanced practice registered nurses and physician assistants practicing in counties with a population of less than 50,000. Provide $7,500 per year for up to four years for advanced practice registered nurses and physician assistants who work in rural areas of other counties (non-urbanized) as defined by the U.S. Census Bureau’s 2010 Census or who work in federally qualified health centers in urban areas. Applications for incentive grants will be accepted until March 15, 2016. Applications postmarked or received via email after this date will not be accepted. 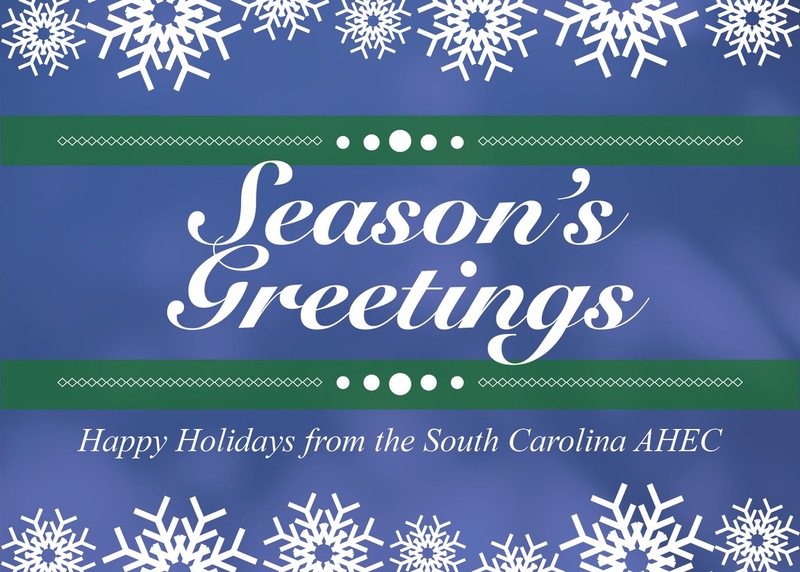 For more information, please visit the South Carolina AHEC webpage. Lowcountry AHEC Health Careers Academy (HCA) students gave a helping hand during the Thanksgiving holiday assisting St. Jude's Episcopal Church in Walterboro with its annual Thanksgiving luncheon. HCA students and more than 100 other volunteers helped to serve food to approximately 860 citizens within the local community. The HCA students maintained the serving lines and prepared plates for delivery to those who are shut-in or without transportation. 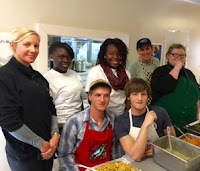 Lowcountry AHEC HCA students have volunteered for the last six of the 13 years that this lunch has taken place at St. Jude’s. Lowcountry AHEC thanks the students for their excellent volunteer efforts!